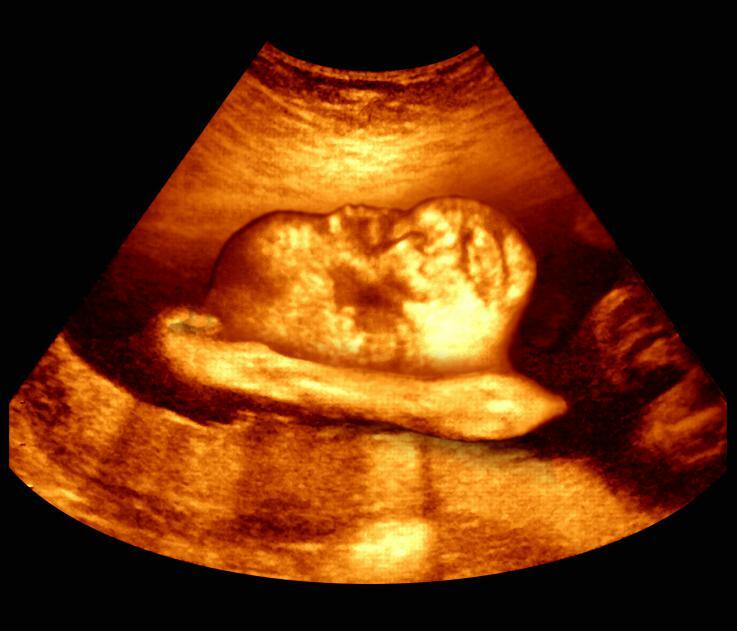 In this image of the baby lying on his side, the arm is positioned beneath the head and is partly outside of the 3D view, allowing structures within the arm to be seen. Part of the bones in the elbow and forearm show here as bright reflections. To get used to the fact that your newborn will arrive very soon, start focusing on life after the birth. Friends and family might now begin talking about what will happen after the birth and what it will be like for you to have a baby. If this is your first baby, you probably can’t really envisage what it will be like to be a mum, and even if you have had a baby before you’ve never had a second or third and so don’t know what it will be like to have another one. Of course you know that life will carry on, but it can be difficult to see past the labour to the realities of life with a newborn. As ever, keep talking to those close to you about how you feel, be it excited or scared and unprepared (usually all three in rapid succession). Talk about what you think or hope it will be like after the baby is born, for example when are grandparents and other key people going to visit, and whether you would like a christening or naming party – or perhaps neither of these. This may help you to get used to the idea that not only are you pregnant but there is a baby coming. How will I benefit from going to antenatal classes? The items required for a hospital or home birth. You’ll be advised on how to prepare yourself for the birth, what to expect in the first few days, and how to encourage healing afterwards, as well as being given tips on looking after a newborn, including nappy-changing, bathing, and establishing breastfeeding. Antenatal classes are a wonderful opportunity to swap ideas and information with a group of people in the same position as you. Long-term friendships can be made here. In a first birth , the cervix dilates by about 0.5cm every hour, compared to 1.5cm every hour for subsequent babies. First-time mums push for around an hour, compared with about half an hour for a second baby. L m 16 week pregnant having low lying prosterior p..
23weeks baby weight 345g,is this normal? Hlo mam Mera 2nd month chal rha hai or me bhot Jad..
Is it normal to bleed while pregnant?